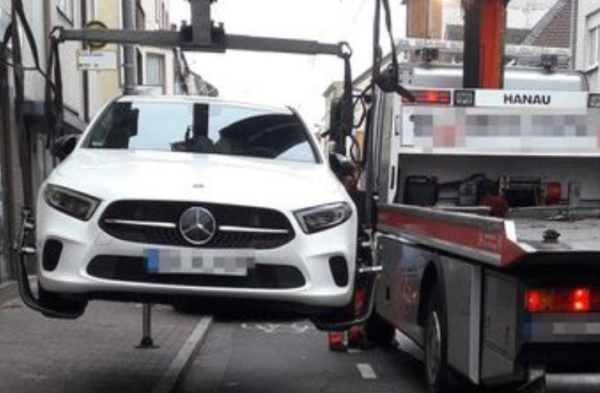 While enforcement of illegal parking in cycling lanes remains limited in Ireland, Frankfurt is lifting cars from bike lanes at a huge rate, above. A hot topic in Ireland of late, the lax of enforcement of laws around parking in cycling lanes has been put into focus by figures coming out of Frankfurt. The city simply lifts vehicles parked in bike lanes. And in October alone 798 lifts were carried out. These involved cars being lifted from both cycling lanes and pathways, though most of the examples online appear to involve cycle lanes. To put that info perspective, Frankfurt has a population of around 730,000. This compares to Dublin’s estimated 530,000 – though the great Dublin area is much larger. The only comparable figures we have for Ireland is the number of fines imposed for parking in cycle lanes. They reached 165 for the whole country last year, a drop on the 205 fines imposed, via fixed charge notices, in 2016. In Frankfurt the authorities have warned that parking in cycle lanes for a very short period, such as enabling the driver make a delivery, often has the most serious consequences. Of late the Minister for Justice Charlie Flanagan has called for more enforcement of the laws around parking in cycle lanes. The Stayin’ Alive at 1.5 campaign, which campaigns for close pass legislation and on other cycling safety issues, said the problem of illegal parking on Irish cycling lanes remains a chronic one. “Drivers parking their cars in these cycle lanes is an ongoing problem, not just in our capital, but throughout the country,” it said. “Even in situations where a driver may just be nipping in to a shop or doing an errand, the dangers cannot be overstated. It said despite Flanagan’s calls in June for great enforcement of “unacceptable” illegal parking in cycle lanes, much progress was still required. “We are not seeing much change in behaviour,” the campaign group added. “Ambitious sound bites will not solve this problem without a real action plan.